Is there any bigger compliment than when a stranger is compelled by the greatness of your outfit to approach you with the potentially embarrassing question “Where did you get that?” This ego-boosting occurrence usually happens when you’re wearing your most luxurious-looking items, whether they were actually pricey or not. So in the name of looking our most expensive, we had to ask: What is it that makes clothes look fancy? Fast-fashion stores like Zara and Topshop are experts on emulating the current designer trends in terms of prints, cuts, and style, but what’s a little harder to fake? Fabric quality. 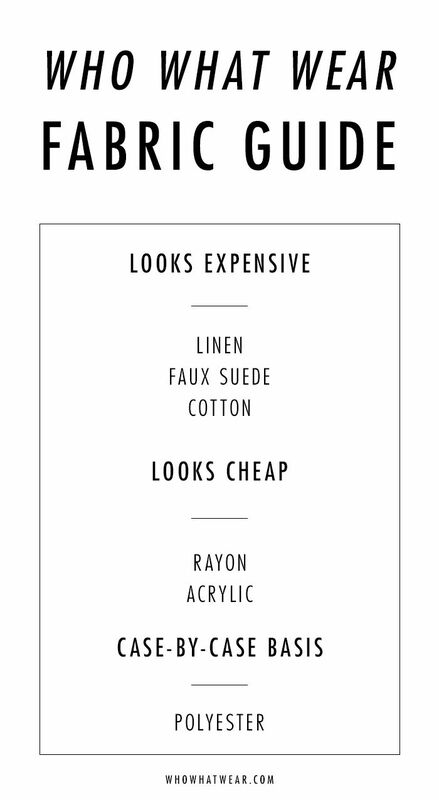 But since we can’t all afford cashmere and silk, we figured we’d do a little research on the best affordable materials that only look expensive, plus which cheap fabrics often belie their humble origins. With your clothing label know-how, you can make smarter and more luxurious fabric choices, even when you’re shopping discount. Scroll down to check out our easy fabric guide and shop some of our affordable finds made from high-quality materials. One of the hallmarks of cheap clothing is a shiny, obviously synthetic fabric. Natural fabrics like linen feel expensive because they have the exact opposite feel. It actually gets better with age, whereas many synthetic fabrics deteriorate at an accelerated pace. We all know authentic suede is an expensive fabric, like most leathers. “Vegan” suede tops our list of great affordable fabrics, because it’s difficult to differentiate the faux from the real, so it naturally looks fancier than it is. Cotton is a high-quality fabric that doesn’t necessarily come at an elevated price. Its natural fibres are its strong point, similar to linen, and the washable, low-maintenance fabric is easy to care for. Rayon tends to age poorly, and it will often start to pill or show wear and tear after a few wears. Acrylic pieces can lose their shape easily, so you after you wash an acrylic sweater, for example, you may find it stretched out and ill-fitting. It also isn’t a very warm fabric for winter pieces. Polyester has a bit of a bad reputation, but today’s versions have a decent feel, and the fabric is so ubiquitous in affordable clothing that it can be hard to avoid. We recommend considering each polyester piece individually—stick to affordable brands known for high quality, and always run your hands over the fabric to ensure it doesn’t feel cheap. What do you think is the number one giveaway of cheap clothing? Let us know in the comments below!